Habit: Perennial herb, on pls, rocks, in rock crevices, or in soil, humus, or on dunes; rhizome short- to long-creeping, branched, glaucous to not, scaly. Leaf: +- alike or of 2 kinds, fertile and sterile; stipe thin to thick, generally straw-colored or green to brown, base persistent on rhizome; blade generally simple to 1-pinnate, membranous to fleshy or leathery; veins free to generally fused, often netted. Sporangia: sori round to elongate (linear), generally 1 per areole, in 1--several rows on each side of segment midrib; indusium 0; spores elliptic, +- smooth to coarse-tubercled or -ridged, scar linear. Genera In Family: +- 40 genera, +- 650 species: worldwide, especially tropics; many species cultivated. Habit: Rhizome long-creeping; scales lanceolate, generally +- brown, 1-colored or often with darker central area or midstripe. Leaf: 0.2--10(20) dm, +- alike or fertile > sterile; stipe glabrous to scaly; blade 1-pinnate to generally deeply pinnately lobed (or simple, unlobed), hairy to not, glandular or not, scales on abaxial midrib near base generally lanceolate or lance-linear, generally +- brown; veins free to fused. Sporangia: sori in 1 row on each side of segment midrib, generally raised, sometimes including sporangium-like structures, shriveled sporangia, or branched or unbranched glandular hairs; spores yellow. Species In Genus: +- 40 species: generally New World, temperate, tropics, few boreal. Etymology: (Latin: many feet, from persistent petiole bases) Note: Identification complicated in California by fact that 2 or more co-occurring species often hybridize (often indicated by malformed spores), especially in CCo (especially Point Reyes), NCo, where the sterile hybrids may outnumber the parental species, and because coastal ecotypes of several species often have thicker, more succulent blades than inland forms. Polypodium australe Fée except (dubiously reported from but not persisting on San Clemente Island). Unabridged Note: A specimen from San Clemente Island (Lloyd & Hohn 4420, UC) identified by several workers as Polypodium australe Fée, a European (Mediterranean) sp., lacks rhizome (rhizome important for identification) and definitive provenance (specimen from cultivated plant that is no longer extant so original locality data not fully trustworthy), and so is here excluded. Lloyd and Hohn (Amer Fern J 59:56--60. 1969) explained its presence as a chance introduction of spores carried on hides of European grazing animals. Apparently, it has not persisted on San Clemente Island, if in fact it ever occurred there at all. Habit: Rhizome 3--6 mm diam, +- glaucous or not, taste sweet-licorice, aftertaste +- bitter; scales 1-colored. Leaf: summer-deciduous, or alive until new leaves formed; blade (5)8--23(38) cm, lanceolate to lance-ovate, membranous to +- firm, midrib adaxially hairy, segments serrate, tips generally acute to acuminate, veins free. Sporangia: sori 1--2.5 mm, generally round, with short, branched, glandular hairs or not. Chromosomes: 2n=74. Ecology: Generally near coast, on pls, rocks, moist rocky banks, mossy logs; Elevation: < 600(1200) m. Bioregional Distribution: NCo, KR, NCoRO, CCo, SnFrB; Distribution Outside California: to Alaska (including Aleutian Islands), reported from Asia (Kamchatka Peninsula). Note: Hybrids with Polypodium scouleri possible; see Polypodium calirhiza, Polypodium hesperium. 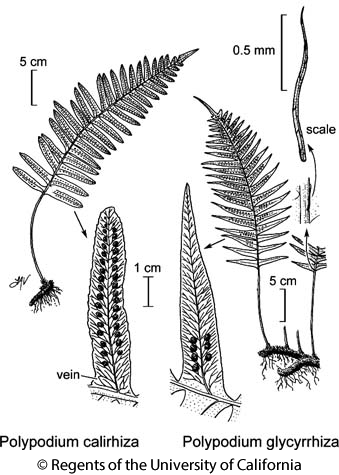 Citation for this treatment: Alan R. Smith 2012, Polypodium glycyrrhiza, in Jepson Flora Project (eds.) Jepson eFlora, http://ucjeps.berkeley.edu/eflora/eflora_display.php?tid=39357, accessed on April 23, 2019.